It is the time of year when all types of sports books on all types of subject flood the market. Baseball books generally dominate, but others make their bid for readership. What follows are reviews of some that make late Father’s Day gift, make good beach reading, make for a place on your reading list. Dan Peary is a veteran sports author who knows his way around baseball history. 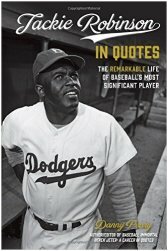 This time he has out-done himself with a voluminous collection of words said about and spoken by his subject Jackie Robinson. Author/editor of Derek Jeter: A Career in Quotes, Peary is at it again in this 436 page opus. We are there through all the decades experiencing all the points of view. The book is about baseball or rather baseball is the backdrop. Number 42 Jackie Robinson is always in the foreground. Quips, insights, memories, stories, rants, raves are all other Peary’s gem. Your loyal reviewer has written quite a bit about the subject is nicely represented in Jackie Robinson in Quotes. HIGHLY RECOMMENDED. “Legends of Giants Baseball” by Mike Shannon (Black Squirrel Books, Kent State University Press), is a slim and over-sized volume of 86 pages. Devoted to a small sampling of Giant greats it is a terrific book for fans of the team. FAST PITCH by Erica Westly (Touchstone, $26.00, 289 pages) is sub-titled “the Untold History of Softball and the Women Who Made the Game. I would argue with the sub-title’s claim for there is much in the book that is common knowledge. Nevertheless, Fast Pitch is a worthy and wonderful contribution showing great effort and research to get at the core of these women pioneers and the trail they blazed. HIGHLY RECOMMENDED. HANDSOME RANSOM JACKSON by Ransom Jackson, Jr. (Rowman & Littlefield, 262 pages) is a long over-due memoir of life in baseball in the 1950s. We are brought back to a time of eight teams in each league, more intimate relationships between teams and players and front office in an era before free agency. There is humor, pathos, detail and headlines in this winner of a book. TERRIFIC READ. Brian Kenny’s AHEAD OF THE CURVE (Simon&Schuster, $28.00, 353 pages) is a lengthy tract by the leader of mainstream media gurus in the field of analytics. He goes inside what he calls “the baseball revolution” to chapter and verse it on such subject matter as “Bullpenning,” “When Bad Contracts Happen to Good People,” “The Mid-Education of the Voting Sportswriter” and much more, The Emmy Award winning sportscaster takes no prisoners but dumps on what he calls “the nostalgia bin.” Provocative, even ground-breaking – if you want to get a glimmer of what it would be like to get an entirely new take on baseball, buy the book. Dr. Harvey Frommer, a professor at Dartmouth College in the MALS program, is in his 40th year of writing books. A noted oral historian and sports journalist, he is the author of 42 sports books including the classics: best-selling “New York City Baseball, 1947-1957″ and best-selling Shoeless Joe and Ragtime Baseball,as well as his acclaimed Remembering Yankee Stadium and best-selling Remembering Fenway Park. His highly praised When It Was Just a Game: Remembering the First Super Bowl was published last fall.